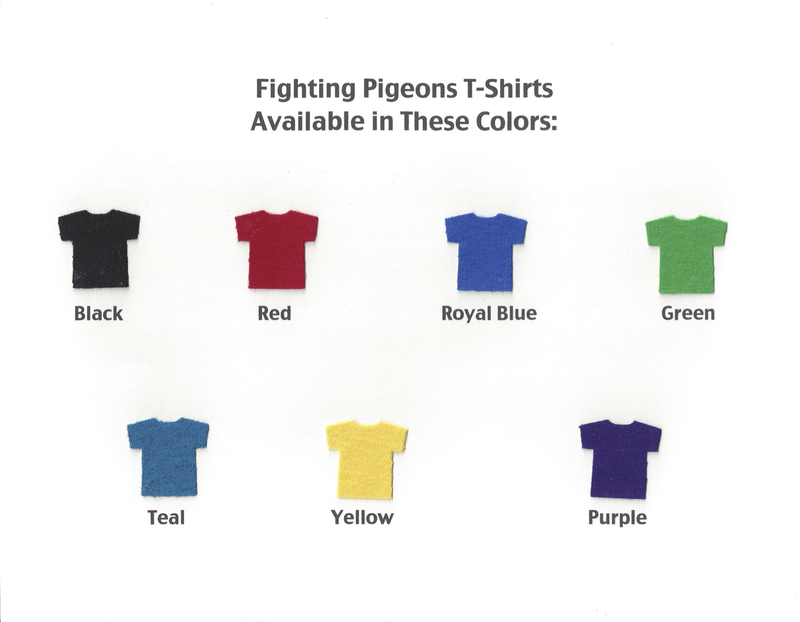 The PTSA is pleased to announce that it will be selling Fightin’ Pigeon t-shirts and hoodies. This year we are able to offer t-shirts in various colors including, black, red, royal blue, green, teal, yellow and purple. T-shirts are available in several sizes and with a “girl” cut style. You can also choose to add your art strand (either dance, music, theater, or visual arts) and class year. Hoodies will be available in gray and with the same option to add your art strand and class year. We will begin taking pre-orders for the t-shirts and hoodies during lunchtime in the lobby of the high school tomorrow, Tuesday, September 23, 2014. Because of the various options on the t-shirts and hoodies, at this time we are only able to offer the t-shirts and hoodies through pre-sales. We also will have sample shirts and hoodies available to see for sizing. We will also be taking orders at the Open House on Monday, September 29, 2014. The order form will also be available to download from our website at www.nwsa-ptsa.org Or you can email Lisa Lauck at lisamlauck@bellsouth.net and request an order form. T-shirts are $15 and Hoodies are $35. Payment must be made at the time the t-shirts and hoodies are ordered as all orders are custom. Thank you so very very much to all of our fabulous families who have sent in their membership fees and donations. Your financial contributions and show of support to the NWSA high school community are truly appreciated. There are approximately 500 students this year at NWSA. Wouldn’t it be amazing if we could sign up 500 new members this year!?!? We will continue to take memberships and donations through September and will have the forms available at the Open House on September 29th. But, of course, we encourage you to take care of this now. If you need the forms,please email membership@nwsa-ptsa.org or visit our website at www.nwsa-ptsa.org to download the form. Note: the 9th grade parents who paid membership dues during May 2014 Arts Orientation are current for the 2014-2015 school year. no need to send in another membership form. Summer is over! School starts on Monday. Are you getting the emails? Are you getting informed and involved? One of fifteen distinguished students from Miami to become a recipient of The Miami Herald / El Nuevo Herald Silver Knight Awards, Kaley Schwartz is the eighth student from New World School of the Arts (NWSA) high school to receive the prestigious silver statue. Selected from the Art category nominations, Kaley’s project entailed drawing portraits of children in the Cardiac Unit of Miami Children’s Hospital and donating them to their parents. “By capturing the innocence and beauty of a child in a portrait without the heartache of medical tubes and wires, I feel I am giving the families hope and peace,” said Schwartz. NWSA has numerous activities taking place throughout the year both on and off campus. We use two services in order to reduce the use of paper! NWSA will be sending important reminders about events using text messages and blackboard connect. You are automatically signed up for blackboard connect when you place your email on the emergency contact card. Remind101 is a text service that allows teachers and students to sign up and receive important information and reminders on their phone. Sign up now to receive updates on important deadlines, meetings and school sponsored events! To subscribe, text 206-496-0683 with the message: @c3ab4, then according to class: @pigeon2018, @blue2017, @red2016, or @yello2015. Text “list” to list all subscriptions, and “stop” to unsubscribe all. Additional help returned by texting “help”. If you would prefer email contact send an email to _list_name_@mail.remind101.com, for instance, c3ab4@mail.remind101.com. The Senior Class of 2014 cordially invites you to the 2014 New World School of the Arts graduation reception. This reception will be held on Wednesday May 28th at the conclusion of the graduation ceremony in the lobby of MDC Building 8. The New World School of the Arts Jazz band will be performing a selection of pieces, and fresh hors d’oeuvres, drinks, and small dessert will be served.